In this popular article, which requires no prior knowledge of astrology, Rudhyar presents the astrological houses as psychological factors and the signs of the zodiac as energy factors. To the person beginning to be interested in astrology, one of the puzzling features of charts is the way in which various degrees of the zodiac are placed at the "cusps" of the twelve houses. The chart is like a wheel with twelve equidistant spokes, and it often appears to the beginner that these twelve equal sections of the chart should correspond to twelve also equal sections of the zodiac; that is, if the first house's cusp is Aries 10°, the second house should begin at Taurus 10°, the third at Gemini 10°, etc. This even distribution of zodiacal degrees around the wheel of the houses appears in what is called "solar charts," but these do not attempt actually to describe the pattern of the heavens — the "state of the world" — at the moment, and from the place of birth. A chart erected for an exact time is, on the other hand, a projection on a two-dimensional plane of the three-dimensional universe, as seen from the place on the earth's surface at the moment in time for which the chart is erected. The difficulty obviously is that patterns in a three-dimensional world can be "projected" on a two-dimensional sheet of paper in various ways. The new maps of the earth's surface publicized since World War II should have made everybody familiar with this difficulty. In an attempt to give a more complete and accurate picture of our continents and seas, maps of various kinds have been drawn; some centered around the north pole, like the United Nations flag's map, others presenting even more, unusual pictures of the earth's surface. Which is the best of these types of maps? The answer depends primarily upon what the map is to be used for. And the same thing is true with regard to the charts used by astrologers. There are various ways of drawing charts, and each way has some value. The main problem, in the case of erecting a birth-chart for a particular moment at a particular locality, consists in fitting together two factors: (1) the zodiac, which we may consider as a narrow celestial belt around the earth, along which the Sun, the Moon and the planets travel; and (2) the wheel of the houses, with its twelve sections of 30-degrees each, and particularly with its two axes, the horizon line (1st and 7th house) and the vertical or, meridian line (4th and 10th house). In our temperate regions, the Sun and the planets do not follow a path which takes them from the eastern horizon to the point overhead (the zenith). Their path — the zodiac — is inclined to the south, and the inclination increases in localities closer to the North Pole. This means that a kind of foreshortening of the zodiacal belt in relation to the unchanging framework of the houses occurs — such as we see on geographical maps. In the latter, the size of some countries is greatly magnified, while that of others is condensed. The distance of 100 miles in one part of the world may be represented by one inch on the map's surface, in another part by ten inches. In the first case, actual earth distances are telescoped on the map; in the second, they are stretched out. Likewise, if one counts the number of degrees of the zodiac between the figures marked at the cusps of the first and second houses of some charts, and the number of degrees between the figures at the cusps of the third and fourth houses, one finds that, say, the zodiacal degrees (which are like actual miles of land) are telescoped in the first house (corresponding to a section of the geographical map) and stretched out in the third — or the reverse, as the case may be. If there is a telescoping or condensation of zodiacal degrees around the horizontal axis of the astrological chart, then there must be an equivalent and compensatory stretching out of degrees around the vertical axis. Thus, a house contains more or less zodiacal degrees. Its "zodiacal density," we might say, varies; for indeed an astrological house is a "container" — as a room contains more or less furniture, objects and people. It is important to stress this point because there has been a tendency among astrologers, especially in Europe, to ignore or underestimate the basic difference between an astrological house and a zodiacal sign. The zodiac symbolizes in astrology the entire cycle of the yearly modifications of the "Life-force", which surrounds, pervades and animates the earth and all organisms living on its surface. A zodiacal sign or degree is a mode of life-energy; it is always "energy" — or rather "energy-substance," as today we know that the two elements, energy and substance, are one and interchangeable. An astrological house, on the other hand, is a section of space — and, in reference to the birth-chart of an individual person, a particular field of experience. It is always and in any case, and wherever the person is born, a twelfth part (or 30-degree section) of the entire space surrounding the place of birth. It is space, not substance; space which "contains" zodiacal energy-substance, planets, stars and any conceivable celestial object. It represents also symbolically a twelfth part of a man's total outlook on life. Every possible experience of an individual's life fits into one of the twelve natal houses, because these refer to the twelve basic categories of experience, in meeting and fulfilling which a person grows to the full stature of maturity. There is, it is true, a general and abstract correspondence between these twelve basic categories or "fields" of experience and the twelve zodiacal types of energies, by using which a person is able to respond to the basic challenges of life; yet there is also and even more an essential difference between the sections of the space surrounding the newborn, and the modes of energy differentiated by the cyclic motion of the Sun throughout the year, and made obvious as seasonal influences. The wheel of houses is a framework. Each part of it is definite, as a room is definite and different in function from another. One does not pass by insensible transitions from the bedroom to the dining room, or from the field of possessions and wealth (2nd) to that of environment, brothers and sisters, intellectual occupations (3rd). But if you look at a spectrum of sunlight with its continuous band of colors, there is no point where you can say that red stops and orange begins — just as you cannot say where heat vibrations end and infra-red light begins. The scale of energies is continuous; but functional sections of space or categories of experience are facts of another order altogether. One follows another logically, but each is inherently distinct, as the realm of the marriage life is distinct from the field of business experiences — even if there are marriages which are mere business matters, and business deals in which your marriage partner enters! This distinction, unfortunately, is not clear to many astrologers and students. The idea is prevalent that the cusps of the natal houses are points in the zodiac; that they simply divide up the zodiac into twelve usually unequal sections — and thus are not basically different from what is also called (Alas!) the "cusps" between, say, Aries and Taurus, Gemini and Cancer. This, to me, is a serious error. It is the zodiac which is in the houses; it is projected within or seen through the houses. But the cusps of the house are not projected upon the zodiac. Each house contains a part of the zodiac — so many degrees of it. 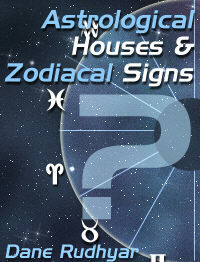 The "zodiacal density" varies in each house. And there are always houses, at whatever latitude, because any place of birth is surrounded by space, and has its meridian and horizon. Even if the entire zodiac is below the horizon, during arctic nights, and the Sun does not rise, still there is a tenth house and stars at the zenith. Houses refer to the most basic of all experiences: the experience of horizontal and vertical, of the space in which to live, to move, to meet and fulfill life, and by doing so to grow as a mature person. The zodiac is secondary in point of awareness and attention. It is the life of our organism projected, as it were, upon the universe. It is the universal life, which we must assume because we are alive; because we sense that this life in us is one with the life in all. We feel that the source of this life-power is the Sun, whose heat and light are essential to life; but such a feeling comes to us later, long after we have had to struggle against gravitation and the hazards filling the space in which our body moves. We, as individual consciousness, deal first with space, with the change between the states of lying down or of trying to walk erect, between dreaming or reflecting and acting through space as an independent being. The houses are psychological factors; then, by extension, they refer to the types of circumstances in which these psychological categories of experiences are normally met by the individual person. The zodiacal signs are energy factors; the zodiac can be interpreted as an "electro-magnetic field" or aura surrounding any organic whole on earth — and the earth-globe itself, also an organic whole. The zodiac is a field of forces; the circle of the houses is a framework — something in and through which life and events take place. The two should be clearly defined and never confused in the kind of astrology which deals with individual problems and psychological realities. This being understood, let us consider the case in which, for instance, Pisces 22° is marked at the cusp of the 1st house and Taurus 17° at the cusp of the 2nd house (the birth-chart of Evangeline Adams). In such a case the sign, Aries, does not appear at any of the twelve spokes (cusps) of the wheel, of houses — neither does the opposite sign, Libra. Aries and Libra are, then, technically called "intercepted signs." On the other hand, the sign, Gemini, is found at the cusp of both the 3rd and 4th houses; the opposite sign, Sagittarius, at the cusp of both the opposite 9th and 10th houses. What can we deduce from this with reference to the psychology of the person whose birth-chart it is? The simplest deduction is that, as there is a condensation of zodiacal energy-substance in the 1st and 7th houses, so there is also an intensification of the capacity to experience in the fields represented by these two houses; i.e. the field of the awareness of one's self as a differentiated and unique being with an original, individual destiny (1st house) and the field of those experiences in which one establishes and demonstrates one's capacity for vital and productive relationship with other individuals (7th house). What matters primarily is not that Aries does not appear on any one of the house-cusps; but that the first house contains a larger than usual proportion of zodiacal units of energy. Experience in this field is more condensed, more intense, more packed with challenges as well as (at least theoretical) opportunities. There is more energy available, because more will be needed by the personality in its development; which means, therefore, more problems to be solved, directly or indirectly. When a house has a high density of zodiacal energies the tendency will be for the individual's attention to be focused in the corresponding field of experience; but, in many cases, it is not the conscious attention which is focused, but rather the compulsive power of destiny, a power which the individual may not objectively perceive or clearly understand. That of which he is perhaps more clearly aware may be the lack of power in other fields yet this lack is actually due to compulsions operating in another field of experience. This does not mean that because there are fewer zodiacal degrees in one house, less will happen in the related field of experience. Evangeline Adams with a 10th house containing only 15 degrees, did, nevertheless, have a very full professional and public life. However, experiences in this professional field were completely dominated by the individual element and the unique destiny (1st house, with 55 degrees telescoped in it and Aries "intercepted"), also by Mrs. Adams' psychic and social gifts related to the 12th house (containing 51 degrees). The fact that most important planets were found in these two last-mentioned houses adds a still greater evidence to the factor of maximum zodiacal density. It should be clear that this factor must never be taken alone, in a psychological interpretation of a birth-chart. No single factor in a birth-chart can ever be taken alone. Nor should it be given too much importance. My purpose in writing this brief article on a complex subject was to provide a direction of thought and inquiry which may be new to many readers, and which may help them to get a new and more rewarding approach to a valid and workable understanding of the difference between houses and zodiacal signs.